Ones that will keep you dry, won’t flip inside out, and actually look good. 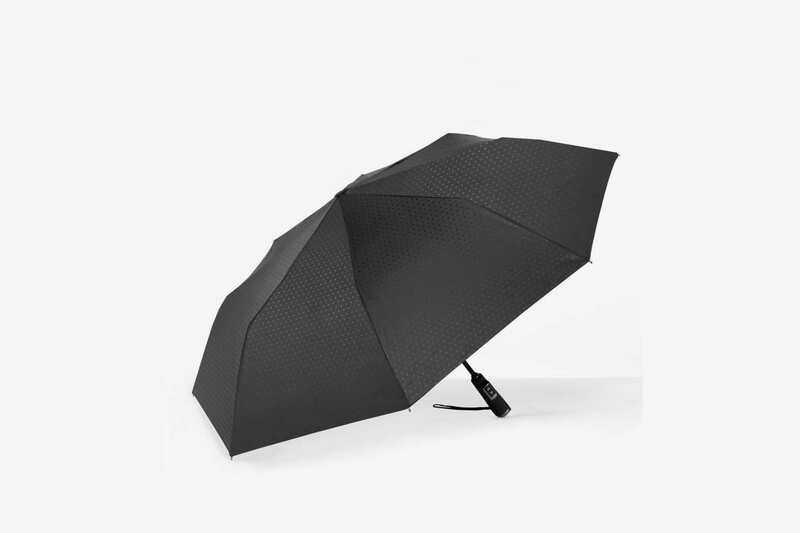 While there are plenty of perfectly serviceable umbrellas out there, we wanted to find the best version possible — one that will keep you dry, won’t flip, is easy to tote around, and (this isn’t asking too much) even looks nice. So ten members of the Strategist team — armed with top-reviewed contenders, from compact and motorized to steel-framed and maple-handled — waded into some of the gustiest corridors of the city. We checked for dryness, of course, but also for how their metal held up in the wind, how easy they were to open and close, and, last but not least, how we felt about being seen with them. 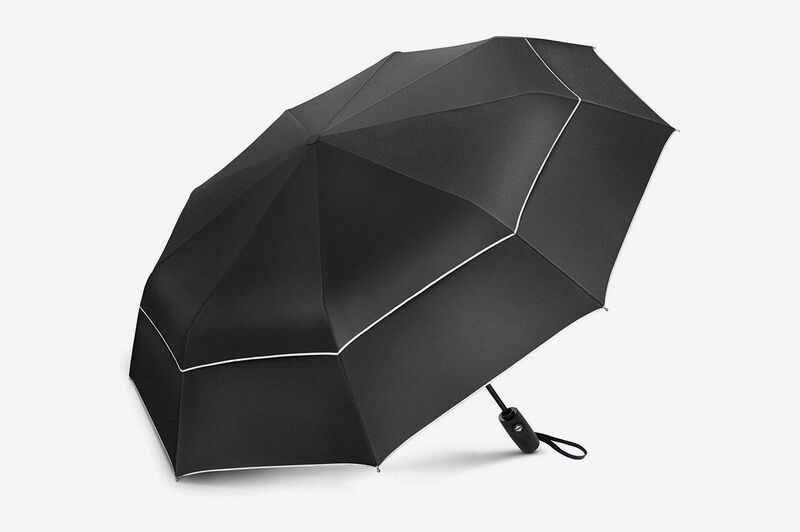 These are 37 of the best umbrellas we tested. 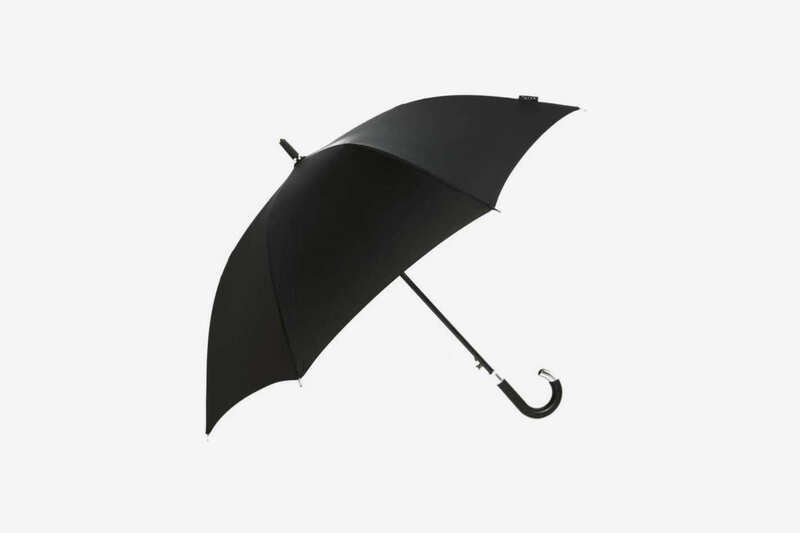 Candidates: We combed through the Strategist’s previous coverage of umbrellas (the best-reviewed versions on Amazon, Seattleites’ favorite umbrellas), talked with shop owners of specialty stores Rain or Shine in New York and Bella Umbrella in New Orleans, and consulted various review sites to find the top-rated sticks and compacts in the umbrella-sphere. 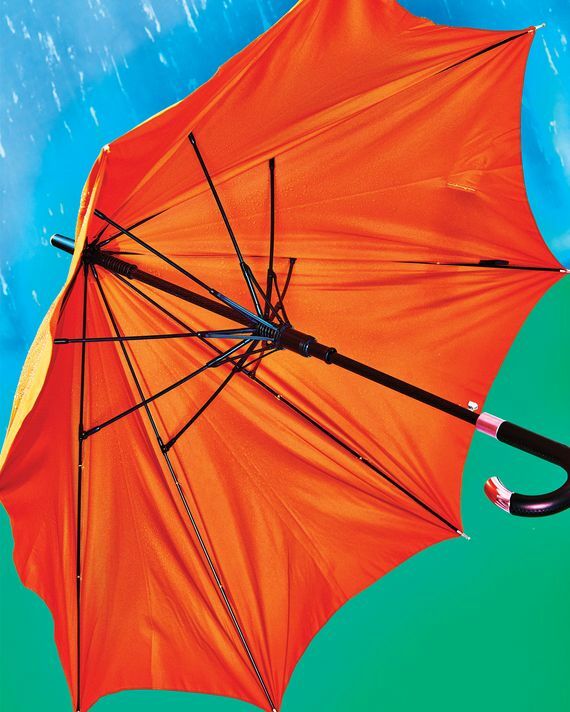 Criteria: The most important thing an umbrella has to do is keep you dry, but not just that — we’ve lost many an umbrella to a gale-force wind, or simply left one at home because it was too bulky for the work bag. In addition to judging dryness, we also took into account an umbrella’s wind performance and comfort (encompassing its weight and portability as well). 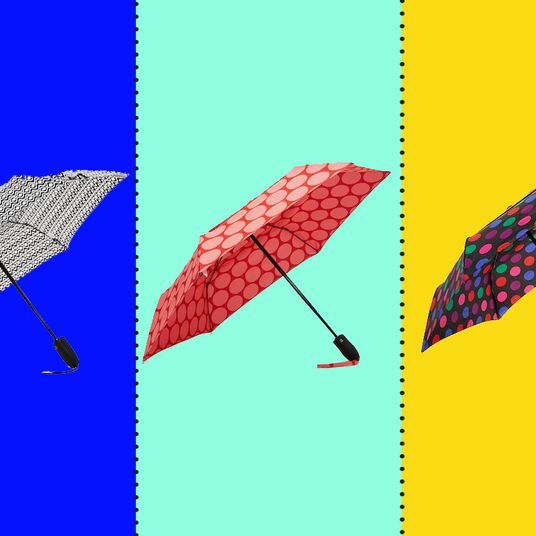 And while we appreciate a nice-looking umbrella, we do think for most people, looks are less important, so we rated each umbrella’s aesthetic on a less heavily weighted scale of one to three. Dryness (1 to 5): How wet did it get us? How soaked did our shirts (and pants) get? 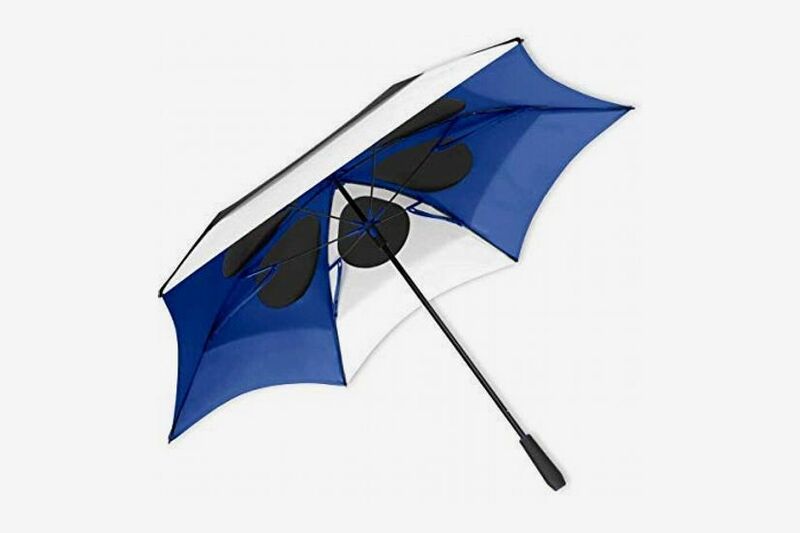 Wind Resistance (1 to 5): Did the umbrella flip inside out? Did it strain under the pressure? Was it vented to let air blow through? 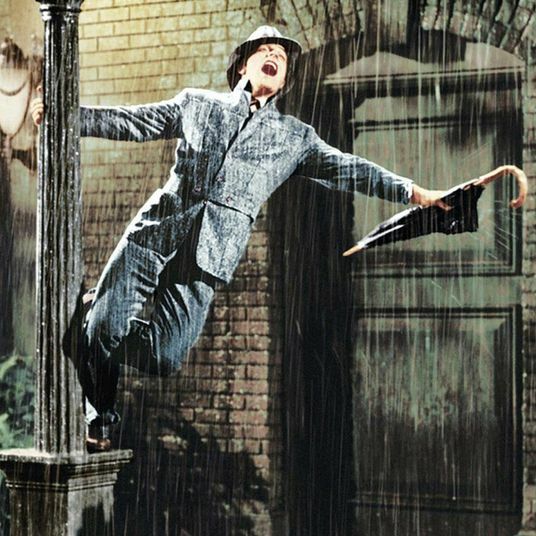 Comfort (1 to 5): How onerous does the umbrella feel? Is it comfortable to hold or does it make our hand cramp? How smoothly does it open and close? How easy would it be tote around? Looks (1 to 3): Does the handle look elegant or cheap? Is the hardware sophisticated? Would you be embarrassed to be seen with it? 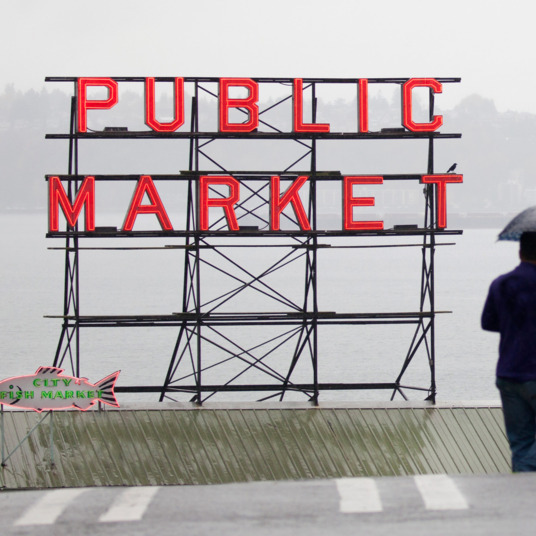 Methodology: Each of our ten writers and editors walked five city blocks under the umbrella (or about five minutes) in light-colored clothing — shirt and pants — to judge the umbrella’s ability to keep us dry. The lighter clothing allowed us to perform a ballpark visual test. We headed to notoriously windy corners (in the Financial District, at Court and Montague Streets in Brooklyn) to gauge the umbrellas’ sturdiness under gusty situations, and when wind did not cooperate, we ran down the sidewalk holding the umbrellas at an angle to simulate wind. 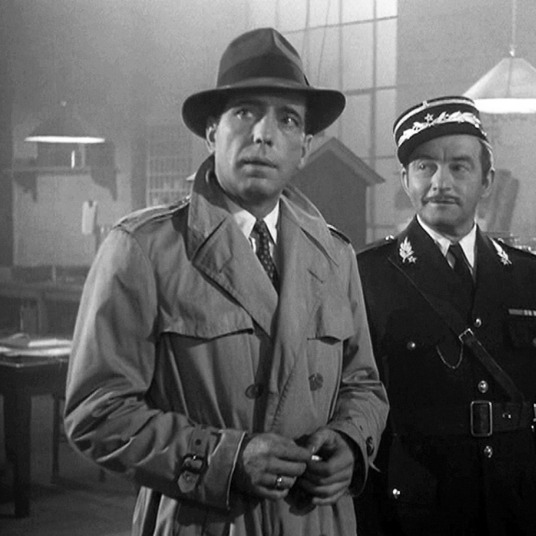 In the event of a tie, the cheaper umbrella “won” (you’ll notice that many of the umbrellas received the same score, in which case we ranked them in descending order of price). Finally, after every umbrella was reviewed, a second tester tried each of the top five scoring umbrellas and rendered her judgment — the cumulative scores for those top five determined the final ranking. In my imagination, rich and famous people carry big umbrellas like the LifeTek stick umbrella (or have it carried over them). In the few blocks I walked under this umbrella, I was exempted from the rain entirely. For its size, the LifeTek is super light and comfortable to carry — even at a full sprint. 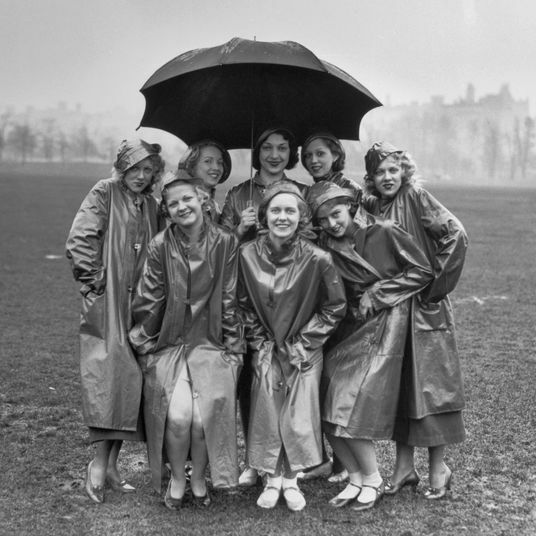 It is, however, a real commitment and for someone who is forgetful with umbrellas, it could be a liability. 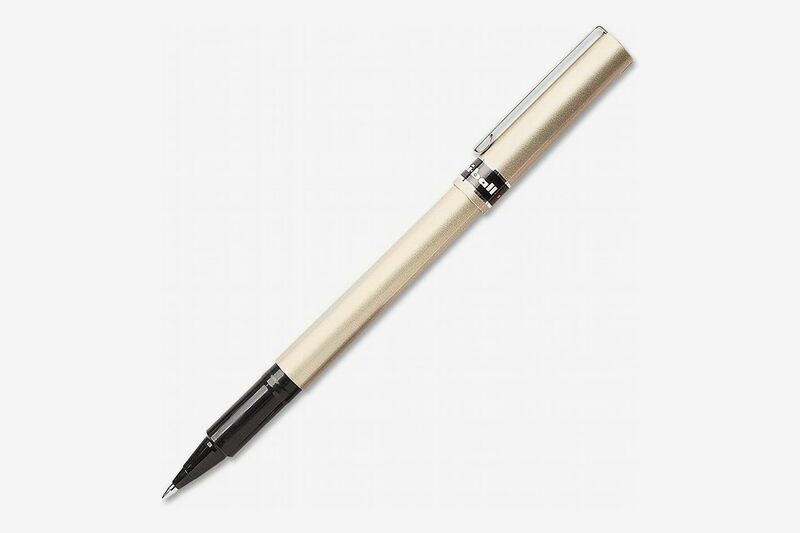 The handle is long with lots of grippy little dimples, lots of leverage and a shiny silver cap. 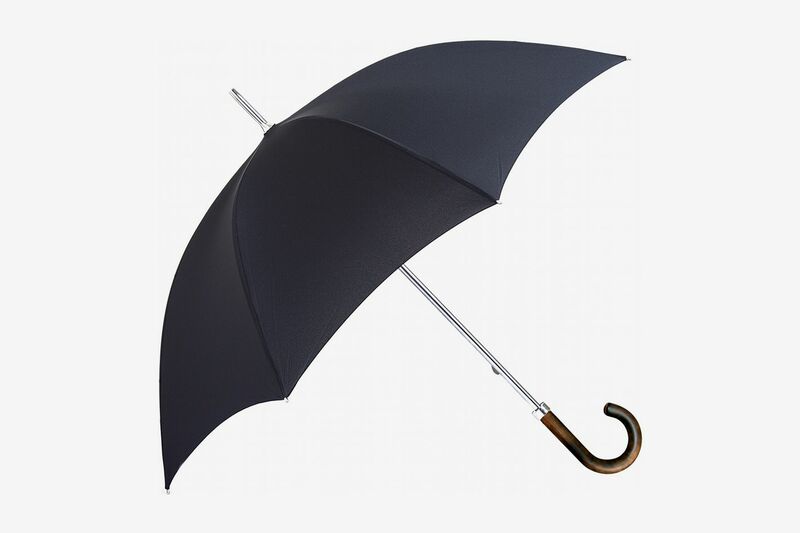 I’ve never been a fan of cane-style umbrellas so this more sleek handle was a pleasant upgrade. 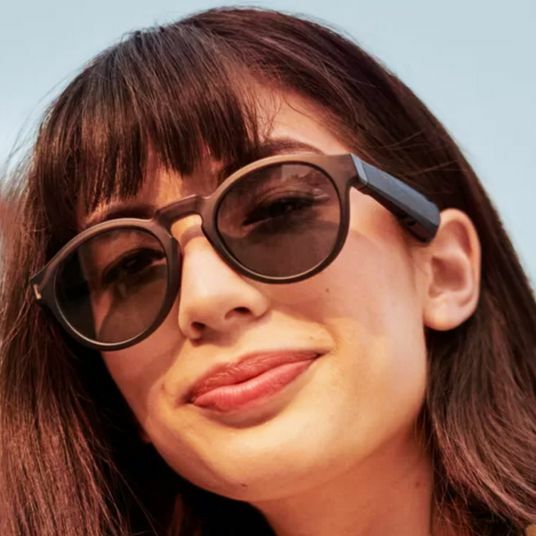 The New Yorker model comes in four subdued colors: navy blue, dark red, and forest green in addition to (and all of which I’d prefer over) the black I tried. — L.C. 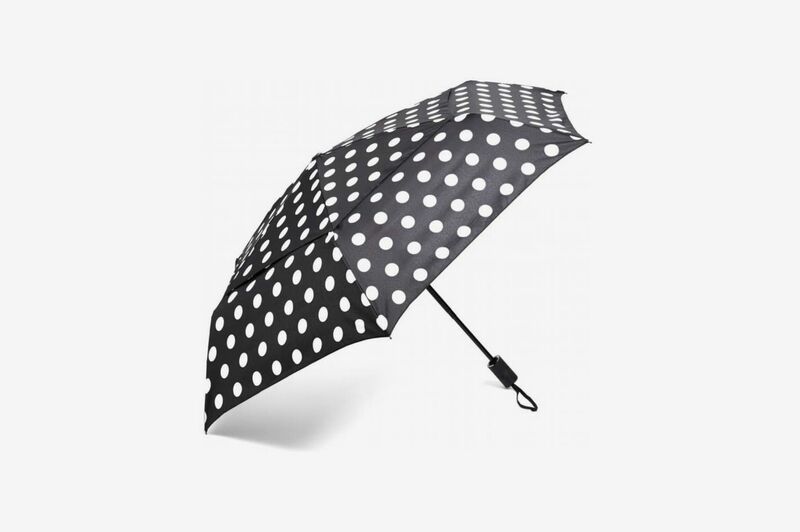 For something with the heft of a bodega umbrella, I was very surprised at how well this little polka-dotted guy from ShedRain held up in a downpour. I never believed in the existence of the super-lightweight and windproof umbrella before finding this one. The rain was moderate to heavy the day I tried it, and the quick open-and-release umbrella kept us very dry, with the exception of a few minutes I spent dawdling on a windy corner, viciously waiting to see this thing get destroyed. It was really straining and quivering in the wind, but all of the spokes that are the first thing to get mangled in a windstorm seem to be hewn together with a metal framework that’s sewn into the umbrella shade, which gives it that extra bit of resistance and structure in the rain. — L.K. This little umbrella checks a lot of boxes for me. 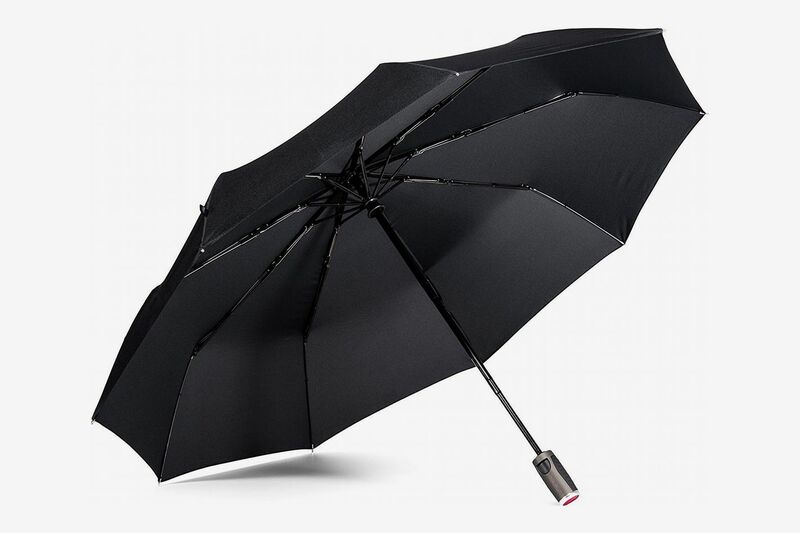 It’s lightweight, very compact but with a handle that’s big enough to actually hold, it has a button that opens the umbrella and partially closes it for you and it’s a little ordinary-looking but still cute. I could fit the ShedRain WindPro in most of the bags I carry to work and it wouldn’t add any perceptible weight. 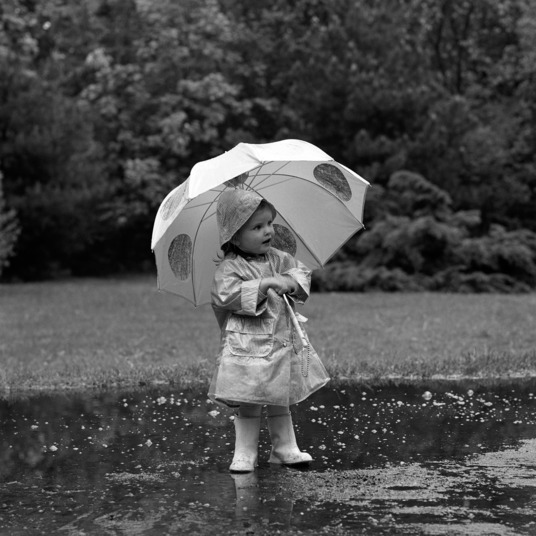 It did not keep me entirely dry but for its small size, it worked well enough. I don’t have any strong complaints about this guy but for what it’s worth closing the ShedRain still isn’t a completely smooth process. Though after my walking test I did give it another open/close try and found that if I concentrated on gripping it with two hands and firmly pulled down I could close it in one motion. — L.C. Impressively large for a compact umbrella, the Davek kept me mostly dry (although some wayward-traveling rain did seep in), leaving me a little unsure this could live up to its promise of keeping two people totally protected. In the wind, the steel ribs creaked a bit, but I never felt like the umbrella was at risk of turning inside out or breaking. Where the Duet truly excels is its sturdy feel, effortless open-close mechanism, and sleek style. The leather wrist strap was an especially nice touch. — K.I.A. My first impression of this umbrella is that it’s way too heavy. Like the smaller Davek it has a luxe leather-covered handle that fits my hand well and a leather wrist strap (which I found unnecessary and stiff). But the weight of the umbrella had already put a strain on my wrist in the five minutes it took to test it. I did stay very dry however with not a drop on my upper half and only my feet affected below the waist. I already carry so much to and from work on a daily basis that the weight of this umbrella is a deal-breaker, though it works inarguably well. — L.C. 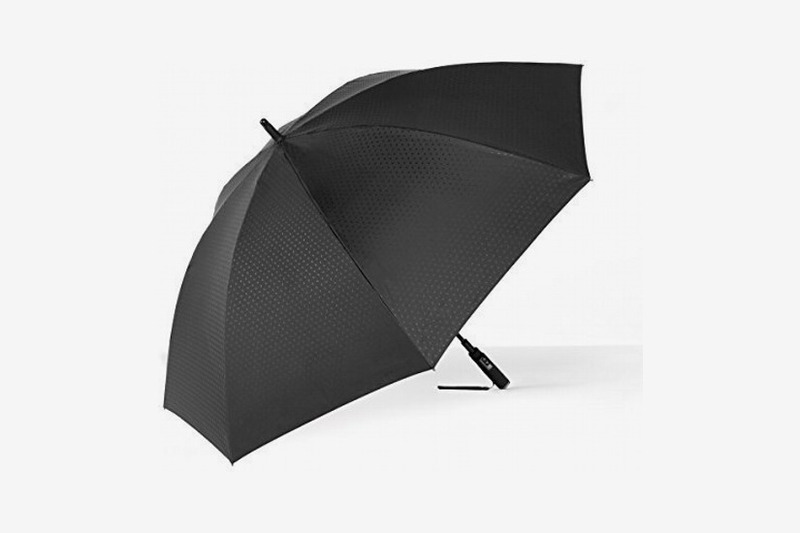 What sets the ShedRain apart from its competition is its reverse-closing style — the umbrella folds up inside out, keeping water off you when you’re carrying it closed. It’s a great feature for when you’re coming in from outside and don’t want to put down or hang up a soaking wet umbrella. 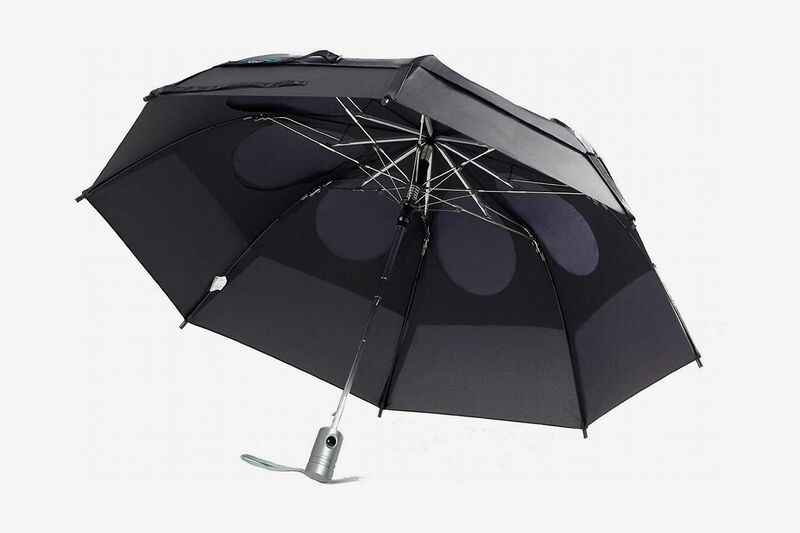 The ShedRain also did a solid job of keeping me dry while I was using it, and the single button that opens and closes the umbrella was easy to use. — K.I.A. 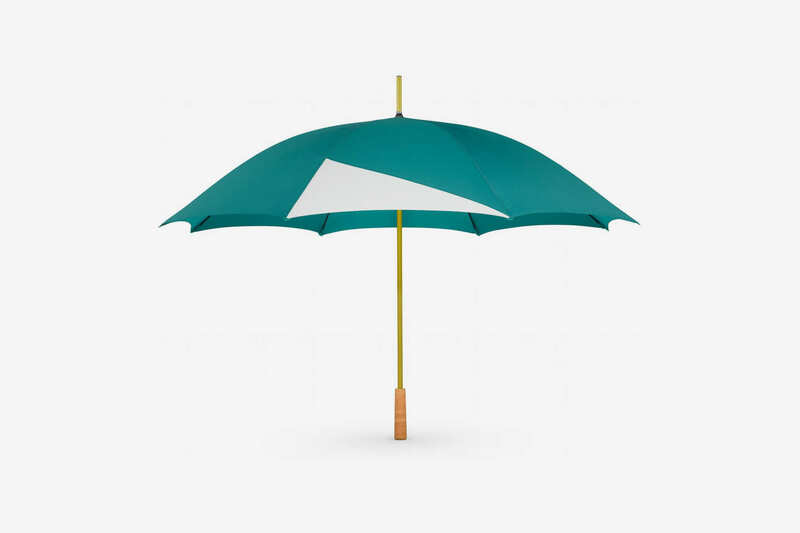 I found the looks of the ShedRain umbrella totally inoffensive. 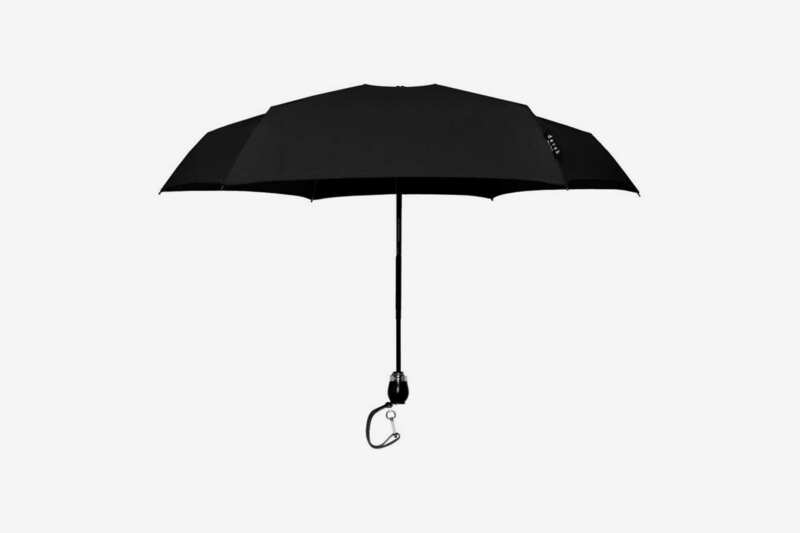 It’s a simple compact umbrella with a minimal handle and soft-ribbon wrist strap, which I actually prefer to a leather strap. It’s lightweight and would fit easily in most totes and backpacks. After taking it out for a test drive I had a few damp droplets on my pants but virtually nothing on my jacket. My main complaint is that the handle on the ShedRain felt loose and wobbled left to right in my hand as I walked and more so as I ran. 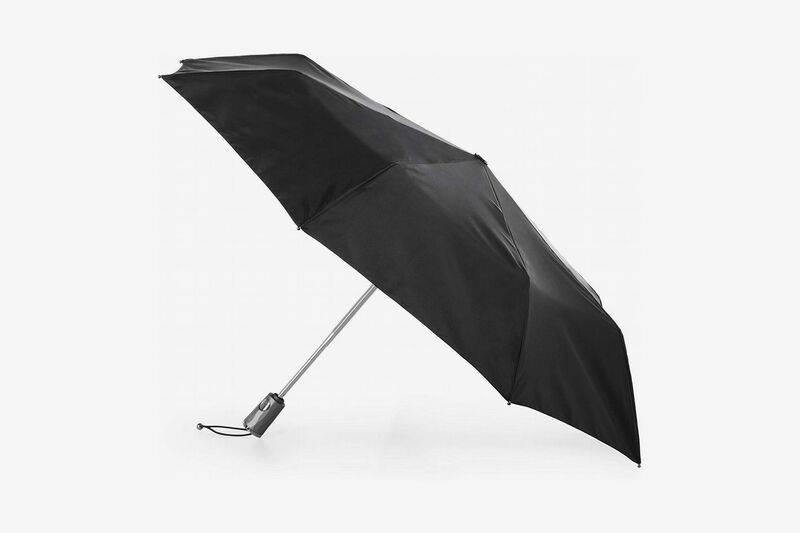 Instead of folding up like a regular compact umbrella, this one folds in reverse to keep you dry when closing it. It still takes an effort to close, but at least I stayed dry in the process. — L.C. Full disclosure: This has been my go-to umbrella for two years now, so I’ve had a lot more experience with it than with the others I tested out. That said, it cost me $15, and it still works great. 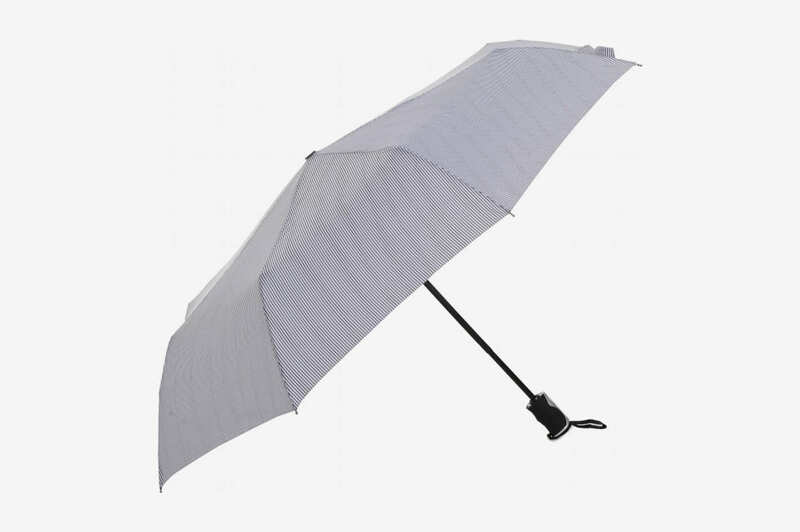 It has a plastic handle and tip which might seem inelegant compared to the wooden or metal parts on other stick umbrellas, but they’re also noticeably lighter in weight. 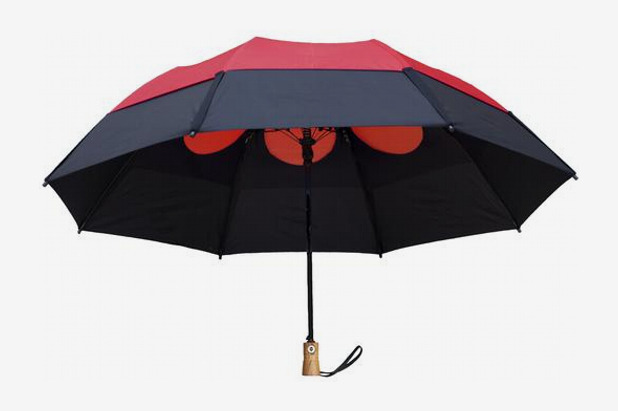 I think everything about this one is “just right.” The canopy isn’t insanely large, but it gives way more coverage than any compact umbrella could, and it’s surprisingly sturdy. It’s never turned inside out in two years, and even though it’s a $15 umbrella, people often think it’s much fancier than it is. — D.N. I didn’t test the “unflippable, unflappable, unleakable” fiberglass GustBuster by affixing it to the outside of a moving car like Consumer Reports did (what an image), but I can tell you that I am a very brisk walker. True to its name, the GustBuster was unruffled by blustering winds and deceptively windy corners, but that double canopy is heavy. Because it’s so physically large you can count on not getting wet unless you’re sharing with two large adults, and the slide open is much smoother than the one on the golf umbrella I have at home. I’m docking points though because my weak hands had a miserable time getting the canopy to close. You really have to mash your thumb down on the switch at the top of the shaft, which, after five minutes of struggling, I finally managed. — L.K. 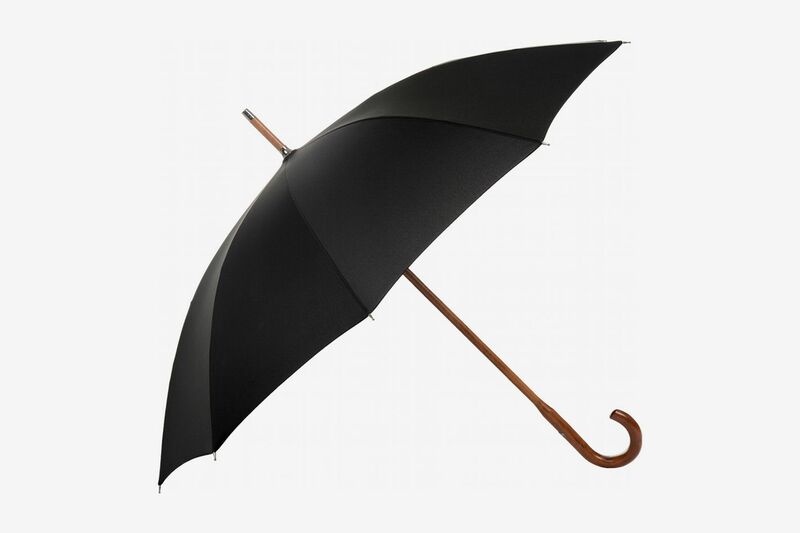 The handsome, wooden handle just looks expensive on this umbrella. You can imagine a top-hatted gentleman using it in a fancy lobby. This baby also does not budge in the wind. I did, however, take off major points because the umbrella is just too heavy and unwieldy for day-to-day use. I was bumped into several times when I was carrying it and, at one point, almost accidentally took somebody’s eye out. It might be a good idea if you’re going to be in an open field during a windstorm, but a bit much for an everyday commute. — D.P. 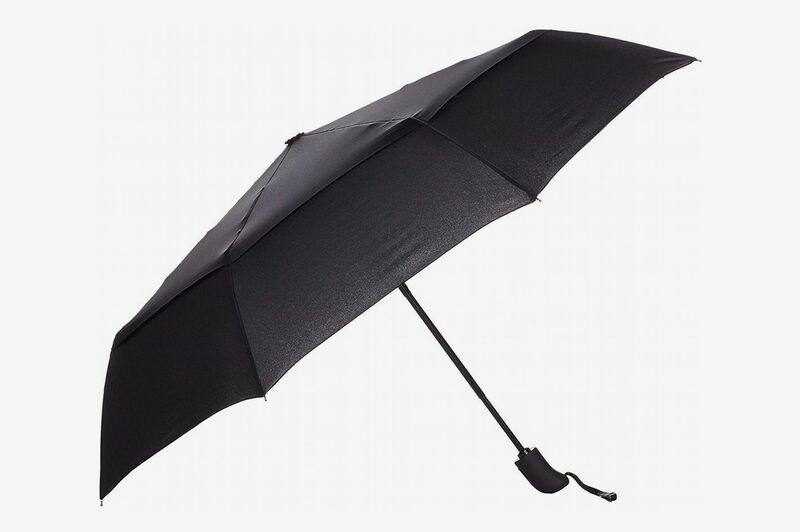 This felt much sturdier than your average compact umbrella. I tested it out by the water in the Financial District, where it gets particularly windy. I could feel the ribs under the canopy adjusting with the wind and redistributing the force; I think it would take a lot to flip it inside out. (I even leaned into the wind a bit to try). It fell short, however, in what matters most: keeping me dry. The canopy is just too small. I’m not sure if it’s just a question of size, or if the issue was exacerbated by the “blunt” petal-like design, which leaves some gaps in coverage. It kept my head dry and mostly my shoulders, but not my feet. I’d say this is great if you want something really compact and durable, but there are some cheaper options that work better out there. — D.N. I ended up liking this one more than I thought I would. Is it necessary to have an umbrella with a motorized open/close mechanism? No. But is it fun? Yes, definitely. 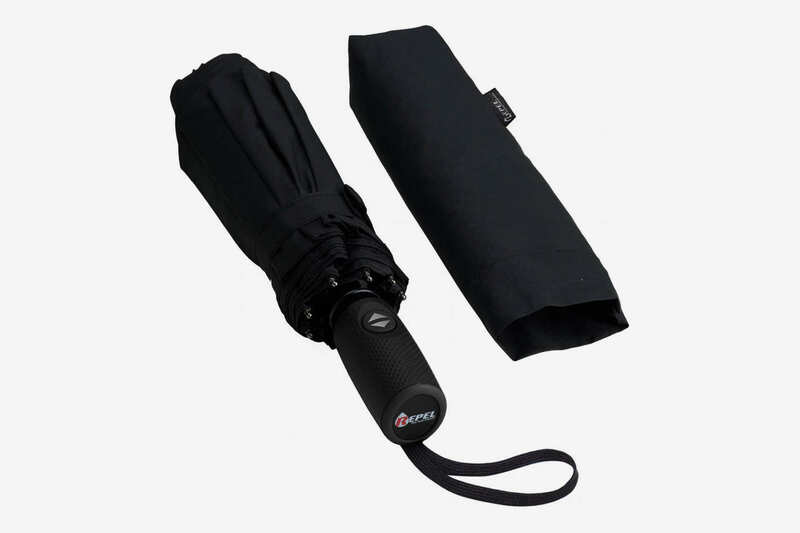 It actually sort of ended up coming in handy: I had it with me one rainy night after grocery shopping, and since I had my hands full carrying a few bags, it was nice to be able to grab the umbrella and press down on the button to open it without putting anything down. I liked that it had a larger canopy than most compacts, too, so I felt well-covered. I’m more likely to use it because of that, not because of the motorized open and close. — D.N. 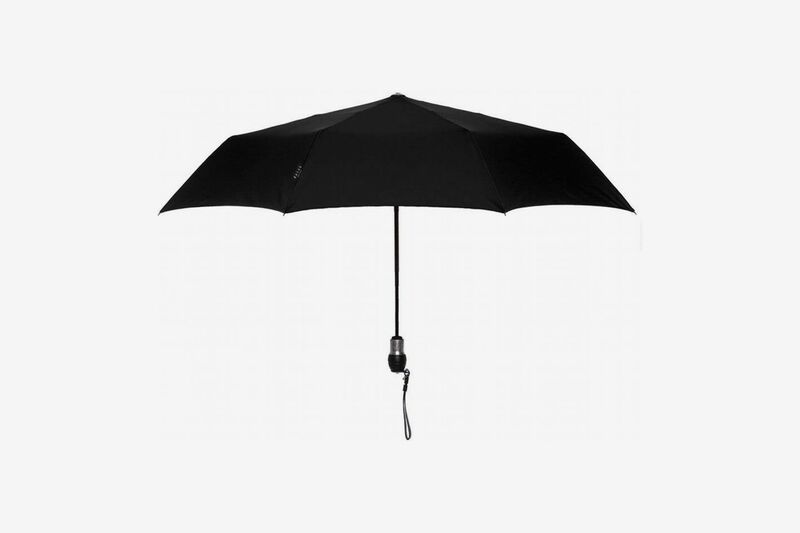 The Lifetek is a simple, all-black umbrella. Not too flashy, but also not particularly special. After I took it for a spin, I was happy to find that my legs were quite dry, but somehow, my upper half didn’t fare quite as well. With the proper rain jacket, though, I think I would’ve been rather comfortable. 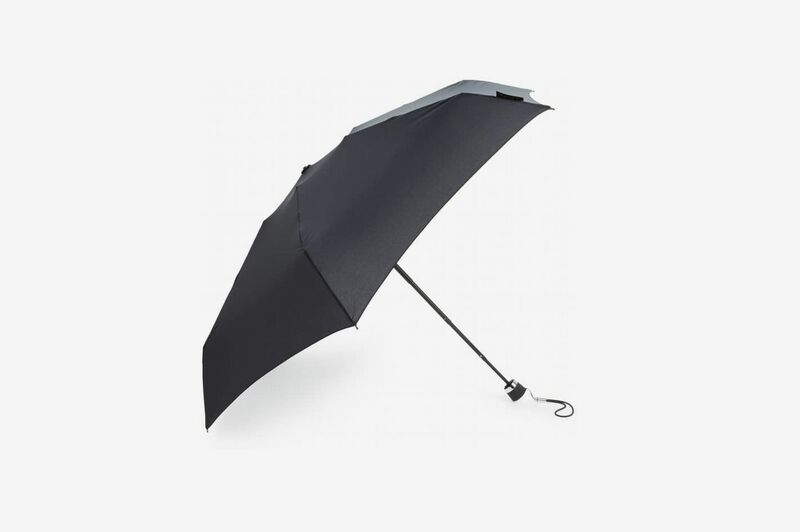 The umbrella opens extremely smoothly with a simple one-touch button, but it’s a little difficult to close, so I docked half a point. It scored almost perfectly, though, because it’s very compact and easily fits in a tote bag. — S.K. This thing can probably handle a tornado. I took it through one of the windiest streets in New York, and it barely batted an eye. That’s likely because of its famous (and patented) “temper-hardened steel joint connectors.” Which makes its relative lightness all the more impressive. The flaws? It has an extra Velcro fastener for the second canopy (one Velcro fastener is plenty for our fumbling fingers, thank you very much) and while it’s kind of neat that its sheath doubles as a backpack, who among us really wants to wear her umbrella? (And the nylon strings got tangled in my tote bag). — A.S. 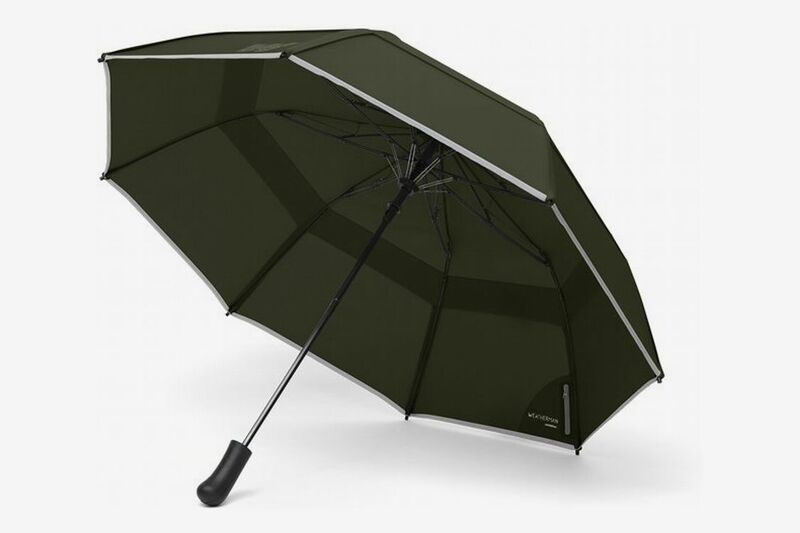 This is a nice big stick umbrella that offers up lots of coverage, but it’s a bit more contained than a golf umbrella, so it wasn’t as unwieldy. The version I tested was poppy-colored with a white accent and a lapis-blue shaft, which places it firmly in “statement umbrella” territory, which might not be for everyone (I liked it). The real takeaway is how light this thing is — it rivals certain compact styles in its lightness. Flipping wasn’t an issue, but given its incredibly lightweight frame, I definitely felt my arm lift up when a strong gust of wind passed through. I didn’t think I was going to float away, but I did feel the need to hold on a little more firmly. The cork handle was comfy, but it was straight and didn’t have a fabric loop, which kept me from being to stow it away once it stopped raining. — S.K. 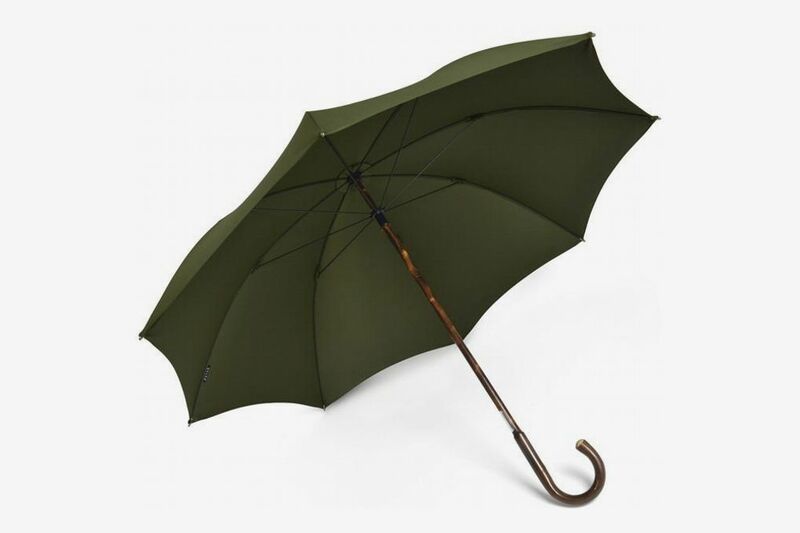 Davek’s long-standing best-seller had no trouble with Montague Street’s gusty pockets and the lifetime warranty is very nice when you are paying $100 for an umbrella as unassuming as the Solo. Maybe my wrists are on the weaker side, but I found it somewhat taxing to close it all the way, especially if I was going to be doing something that required speed, like, say, racing to catch a subway train. — A.S. This 68-inch umbrella obviously kept me dry — it’s like walking around with a patio umbrella, and just as unwieldy, although given how large it is, I was surprised by how lightweight and easy it was to carry (probably because of the fiberglass shaft). 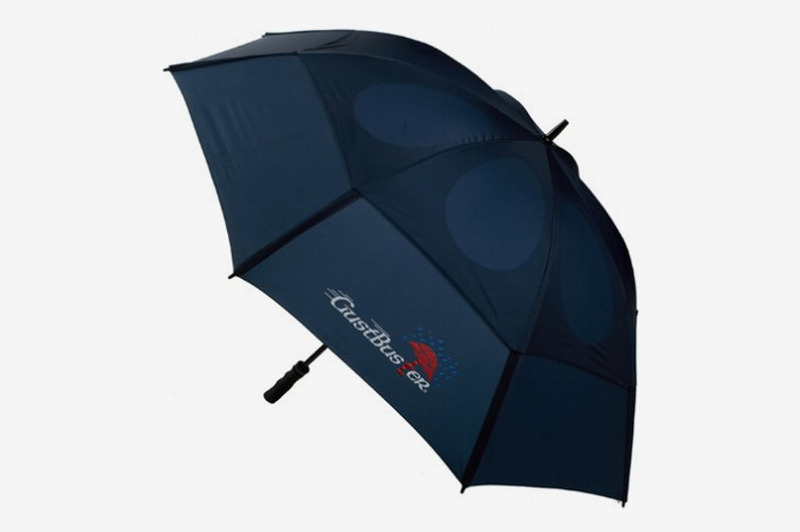 The foam handle — a mainstay of golf umbrellas — was also extremely comfortable, and the umbrella’s wind performance! Procella claims it can withstand winds up 46 miles an hour, and I believe it. The major downside: that overbearing giant logo. — J.C. I loved the way the cork handle felt in my grip, though it would’ve been much more functional if it were a hook; I had a bit of a hard time toting it back from work because there was no real way to transport it without holding it in your hand. It also doesn’t have an automatic open/close, so you have to use two hands to slide the runner up to the top — a silly design flaw that even bodega umbrellas have advanced past. The umbrella did a terrific job of keeping me dry, though, and it felt strong in the face of wind, too, though there were some bursts that made me feel like I might get carried away like Mary Poppins. The looks aren’t quite to my taste, but they are a colorful departure from the standard black or navy. — J.C. 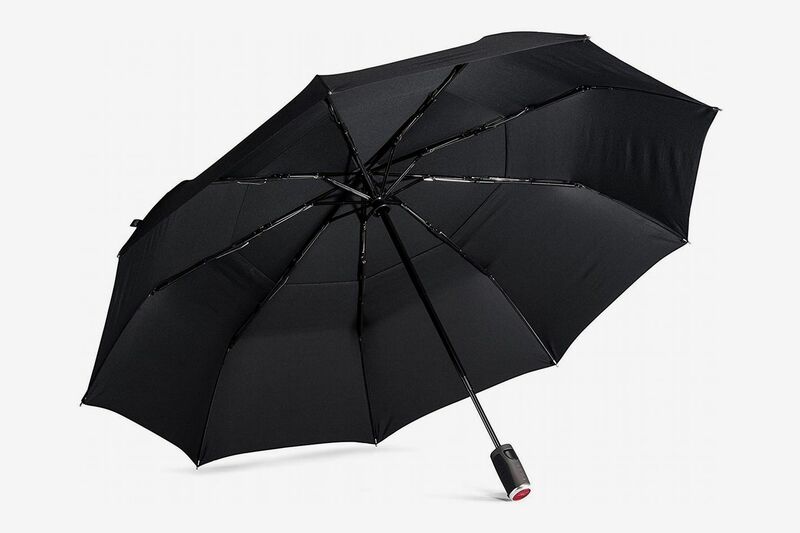 If you’re looking for a compact umbrella to keep in your bag or at your desk during an emergency storm, this would be a solid pick. 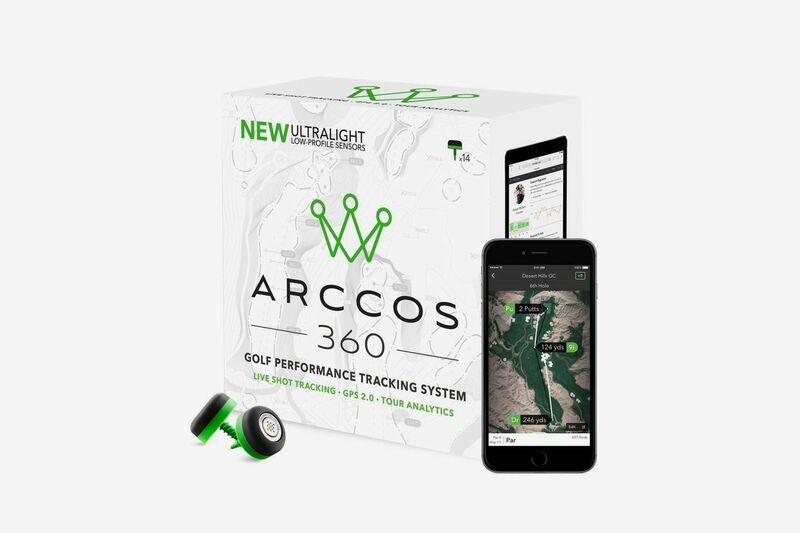 It’s extremely lightweight and compact so it’s easy to carry around and it provides enough coverage to help you stay dry. However, probably because it’s so light, the Totes felt flimsy when I turned onto a windy corner. The ribs flexed and the canopy lifted up in even a light wind and felt like it’d be close to flipping inside out under the pressure of anything heavier. — K.I.A. 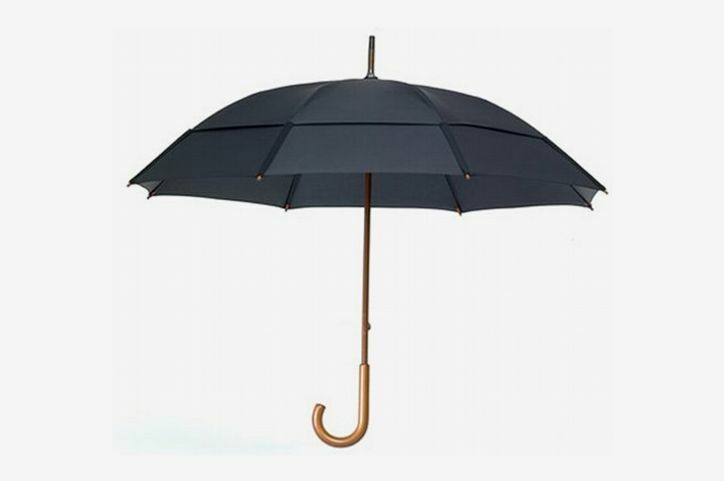 This umbrella is really ideal for those non-downpour rainy days when you want to feel somewhat stylish and a little bit like a Japanese teen; if it’s raining hard, your pants and feet may get wet. But if we’re talking a normal rain shower, the Totes will not only keep your upper body very dry, but you’ll really be able to see where you’re going. Because it’s a bubble, I could rest it on my head at stoplights and use both my hands to check my email. — A.S. 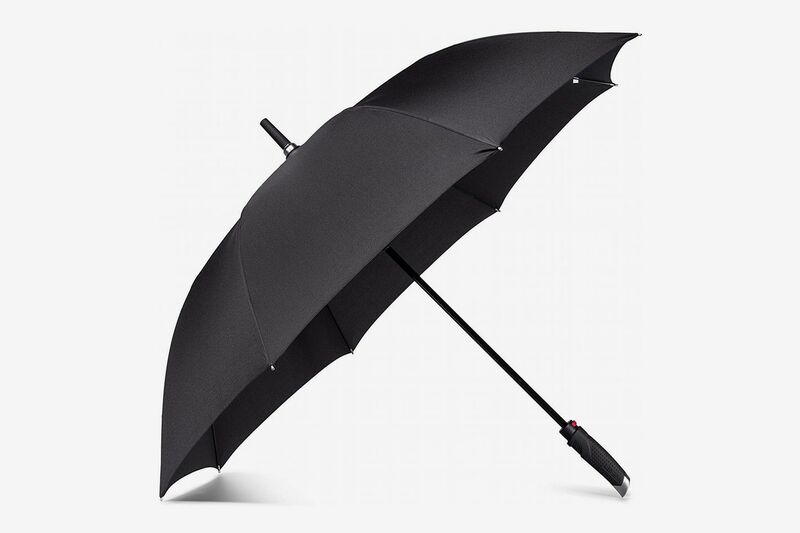 This feels like an upgraded version of the standard, generic compact umbrella. 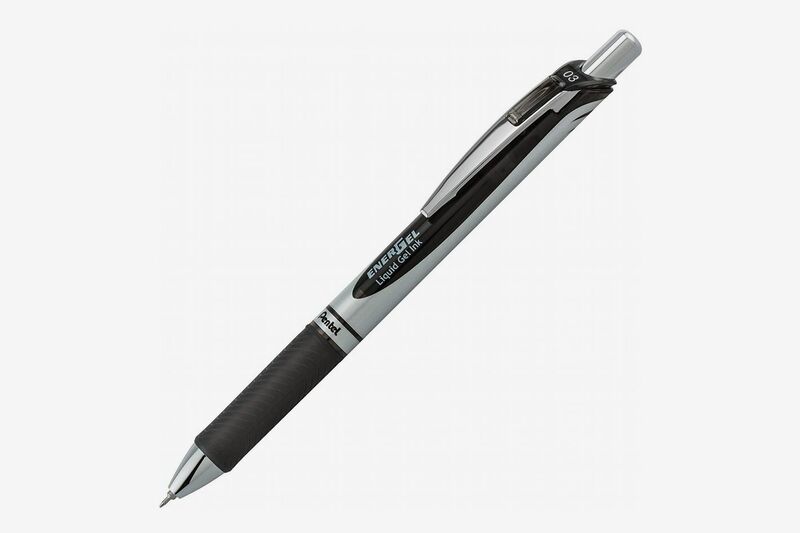 It’s really comfortable to hold actually, thanks to its lightweight construction and “just right” handle shape. 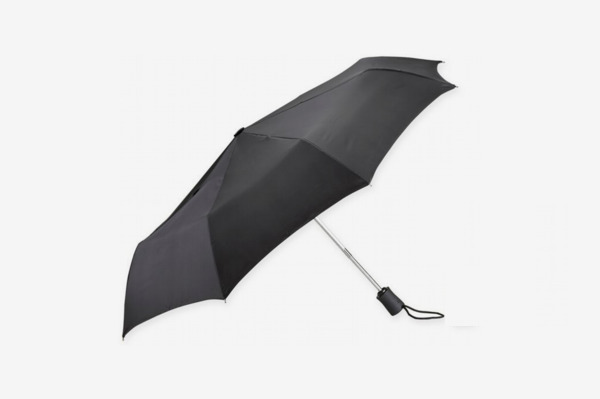 (My personal bias is toward full-size stick umbrellas, but the Stormy Weather was the most comfortable of the compacts I tested). It’s not winning points on style. 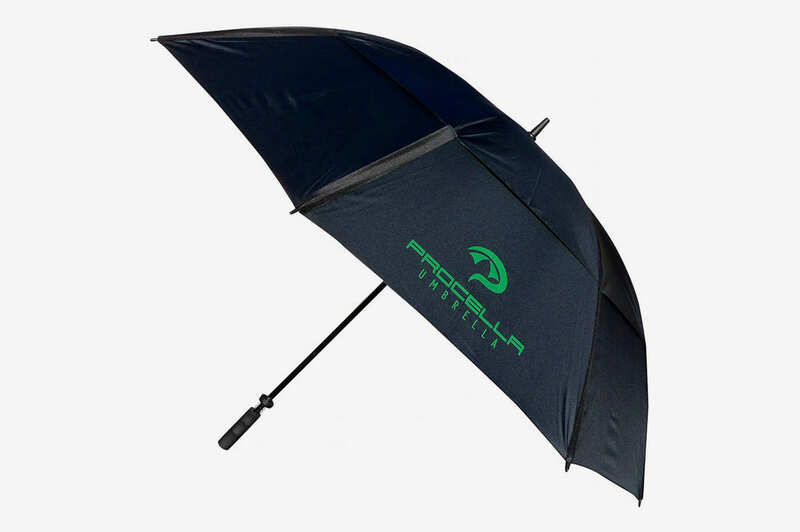 It’s the type of umbrella you might stash in the back of your car, or in a drawer in your office; you forget about it until you need it, but when duty calls it should get the job done. — D.N. With its vented canopy, this umbrella lived up to its name — there wasn’t any wind turbulence that made it turn inside out or feel anything less than solid. 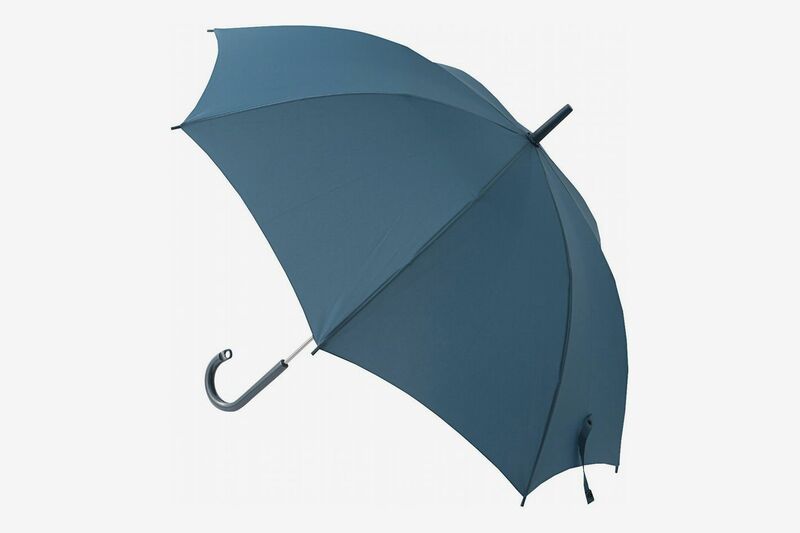 The umbrella has a short barrel handle that isn’t particularly comfortable to hold, though, and it’s definitely not good-looking enough that you’d be proud to carry it around (or even lend it to a friend). It did a decent job of covering me from the rain, but because the umbrella pole doesn’t extend very far, I felt like I had to constantly readjust how high I was holding the umbrella to make sure it gave me decent coverage. — J.C. This umbrella is really, really small. 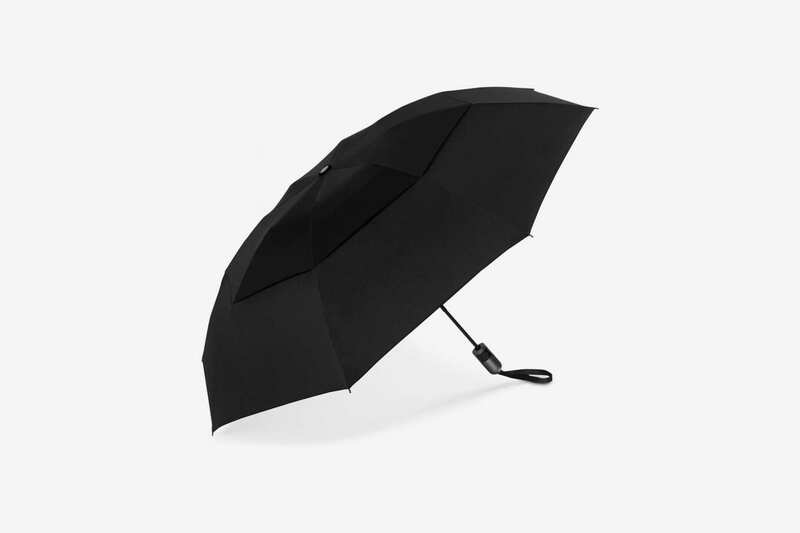 Once the rain stops, it’s not a bummer to carry around — easily the worst part of the whole umbrella experience — but when it is raining, the diameter of coverage (around 38 inches) is going to be smaller than your standard $5 umbrella, which is usually 40 inches or bigger. It doesn’t cover a lot of ground. When walking it almost always needed to be held forward at a 45-degree angle to gain better coverage, which is cumbersome and annoying — I definitely got wet. 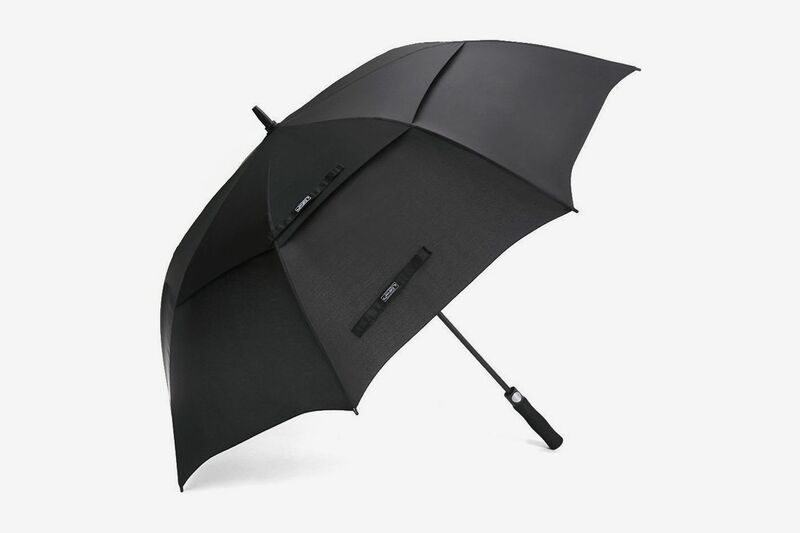 But perhaps you think the best umbrella is the umbrella that’s always on you, and you could definitely keep this in your bag permanently without it hogging space. The lighter structure also gave it a slight swaying feeling against the wind, though it never felt like it would snap or flip. — S.K. 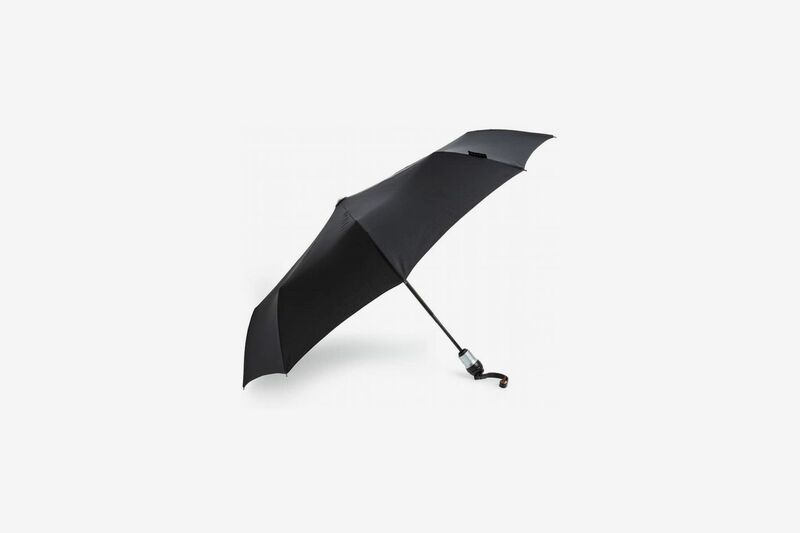 A mostly functional umbrella with a sturdy design, the Blunt has some design flaws that made me question if it was worth the price. While it has a wide canopy, its rounded-tip edges left openings for rain and wind to blow in. It’ll definitely still keep you dry, but for an umbrella of this size I expected total protection. Even compared to other large, stick umbrellas, the Blunt felt heavy to hold and my wrist cramped up when I tried to juggle it while also carrying bags. — K.I.A. Okay, the canopy on this one is comically huge, but I kind of loved it. This umbrella has two Velcro closure straps, it’s that big. You press the button and it slowly slides open like you’re powering up a lightsaber. I got a lot of weird looks walking around the East Village and taking up all of the sidewalk’s air rights, but honestly it felt kind of nice knowing that the rain wasn’t going to touch me or basically anything within a three-foot radius. Obviously, it’s not an easy thing to carry around. It’s pretty heavy, and I found the straight handle less comfortable to hold than the standard stick umbrella “hook handle.” The padded material on the grip feels a little cheap too. The vent is a nice touch for wind, but since this thing is so huge, it does have a tendency to “catch” in the wind. — D.N. 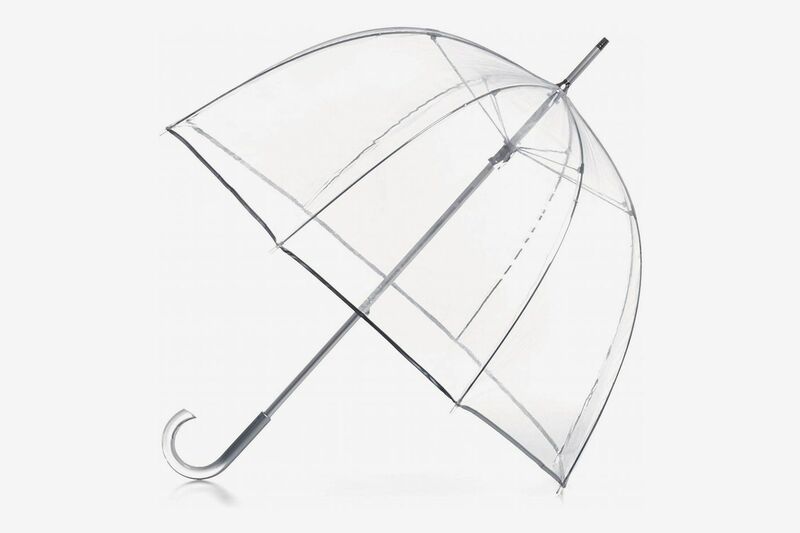 I wanted to love this umbrella because I genuinely believe not even gale-force winds could cause it to buckle. But it has to be said that the pole is so tall and the circumference is so vast that I couldn’t find a comfortable position to hold it. I was either holding it too high and tiring out my arm or holding it too low and cutting off my visibility. In either position, I felt like I didn’t have a good grip. Admittedly, I am a weakling, but it’s simply too big for the average person’s needs. Yes, I was extremely dry, but I had to work too hard to stay that way. — D.P. The canopy of this compact version doesn’t pitch that high, so side-rain (it comes from all directions!) was an issue. I found that if I angled it too far one way or the other, drops from the umbrella would hit the back of my pants, too, because its coverage was just not enough (it’s 38 inches across). I do have to say that though I had doubts about its wind resistance, the retractable frame and shaft stayed secure even after a gust. 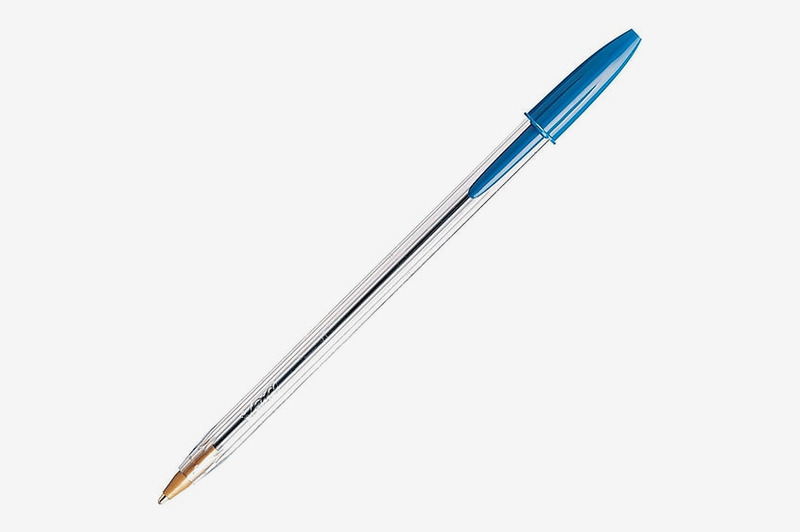 I had to subtract a point for comfort because the click-button release doesn’t respond that quickly, though it does automatically open with the push of a button (good for one-handed use). Its aesthetics aren’t anything to mention — it’s just a very standard-looking umbrella. — S.K. The Traveler really was spiffy for carrying around — it felt light and nice in my hand. In the rain, though, it ran into some problems. I felt that the pole was a bit short, which meant I had to hold the umbrella pretty far down to keep it close to the top of my head. A blast of wind came by though, and flipped the umbrella inside out — two blocks later, it happened again. It’s sleek and nice-looking enough, if nothing special. — J.C.
My shins and shoes got a little rained on, but the rest of my body stayed pretty dry. It’s totally average against the wind. It didn’t feel the most sturdy, but I didn’t fear that it would flip inside out either. 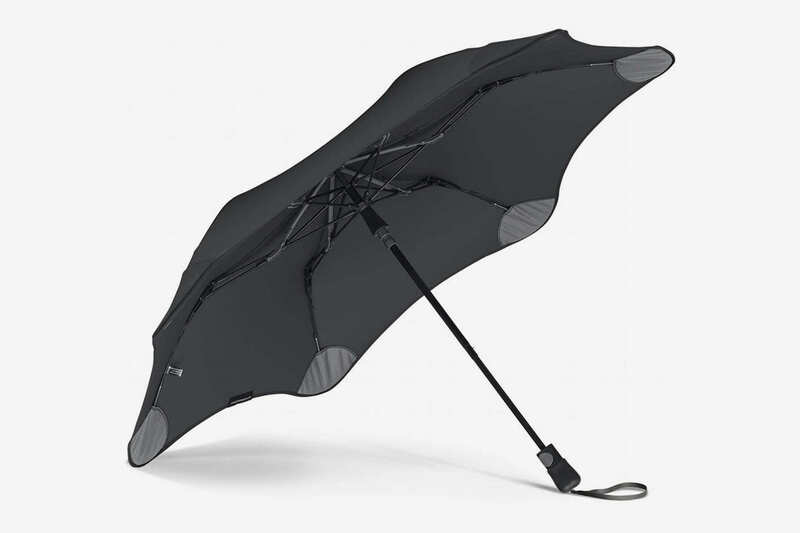 For a “compact” umbrella, though, the Weatherman Collapsible is overly big. It’s too long to comfortably slip into a backpack or tote bag. 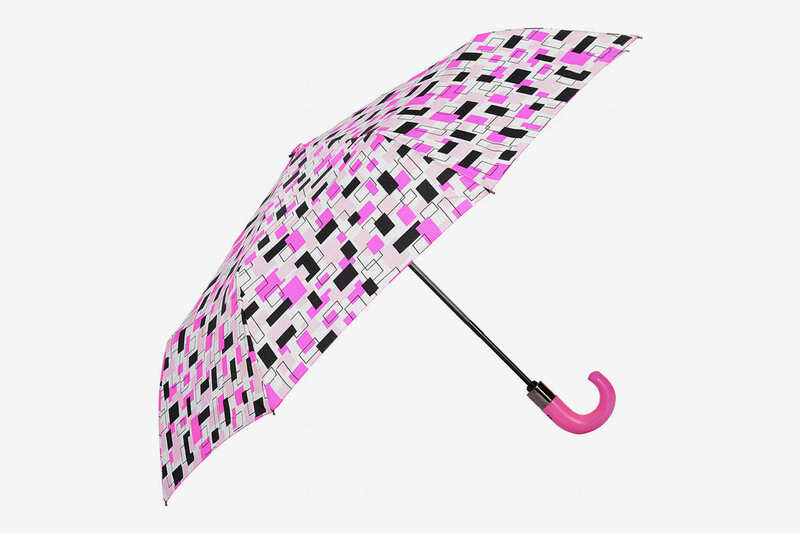 And while the umbrella’s biggest selling point is that it comes with a little Bluetooth-enabled tile to keep track of it using Weatherman’s app, I could not figure it out (and I’m fairly tech-savvy). It connected to my Android phone, but I couldn’t get it to update. In fact, after a week, the battery seemed to have died completely. — M.B. I felt like a real dapper Dan toting this French-made umbrella around town. For its drinks-at-the–Harvard Club looks, the Pierre Vaux is quite lightweight, but big, big points against it for pinching my fingers more than once upon closing it. — A.S. 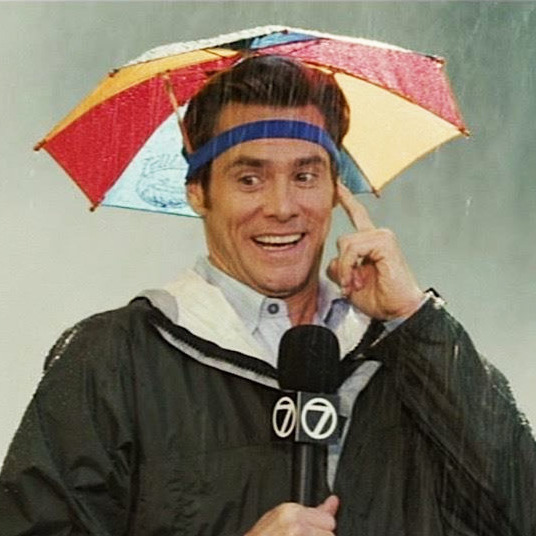 I have to say, I did not love this umbrella. The main draw to the inverted design is that it collapses in instead of opening out, saving you from having to deal with a dripping-wet accessory, but other than that nice touch, the construction feels a little flimsy. The dome of the umbrella is quite shallow, which gives excellent visibility but didn’t offer very much in the way of protection. I didn’t love the pattern, either. — D.P. Testing on this Eez-y travel umbrella started during the great rain/snow drizzle of 2019, and though it wasn’t quite raining, I noticed that the shallow wingspan of the umbrella shade combined with the angle of the wind meant that approximately half of my body was pelted with snowflakes. It does okay in moderately windy conditions, but it threatens to invert if the wind even slightly picks up. I could see it getting trashed by a stronger gust of wind. — L.K. 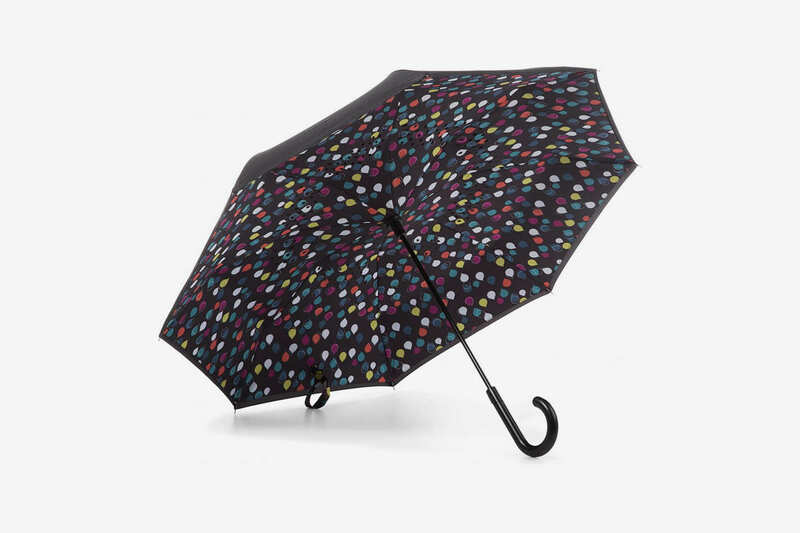 This umbrella comes in a loud print that would probably be to few people’s tastes. It has a chunky pink wooden handle that is surprisingly difficult to grip. For the price, you’d do better with one of the slightly-less-expensive $20 options on this list. It keeps you moderately dry (the tips of my scarf ended up getting wet) but ultimately its spring-loaded button isn’t very smooth to open and close and it has a flimsy fabric that won’t last long without flipping under windy conditions. — L.K. 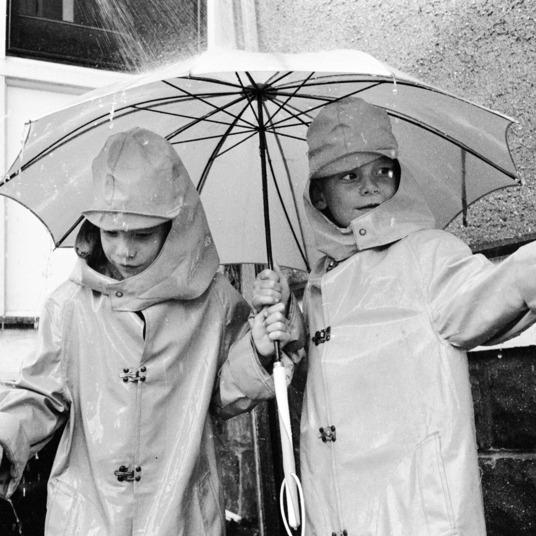 What’s the Best Raincoat for Men?